Yesterday afternoon saw president Dilma Rousseff kick the ball for the first time at Arena da Amazonia, Brazil’s latest stadium. Initially it was announced to open today, but plans needed changing after last Friday a worker was killed in third unfortunate accident on the site. This is why only a modest ceremony was held, while on Sunday the stadium will be visited by Jerome Valcke, FIFA secretary general. While last works go on, here’s how the stadium’s story began. Decision to build a new stadium in Amazon metropolis of Manaus was made in 2009, as the city was shortlisted to host the 2014 World Cup. It was the only city so deep Inland to be selected, raising controversy. Additional doubts were raised over lack of strong anchor tenant to take over after the World Cup. 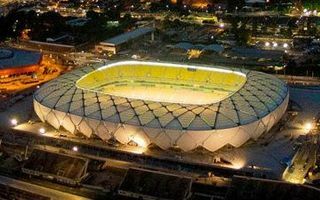 The stadium is located in the place of Estádio Vivaldo Lima (commonly named Vivaldao), the previously largest ground in Manaus. Though its official capacity upon closing was 31,000, record attendance stood at almost 60,000 people. The new stadium was called Arena da Amazonia to create direct reference to the stadium’s location and identity. Along the concept by GMP Architekten the stadium’s outer shell was designed to resemble a typical Amazonian basket, which often have diagonal patterns. The stadium’s seating creates a yellow-orange mosaic to resemble fruits carried in the basket. Though much simplified, the symbolism was implemented. Diagonal pattern is created by the steel roof trusses, which – apart from structural and aesthetic roles – also provide gutters to collect the daily rainfall. Four basins can take up to 120,00 litres for further use. Between the steel frame 252 fiberglass sheets were mounted, forming larger diamond-shaped near the basis and smaller on the roof. Inside there’s room for 45,500 seats, although the capacity has initially been reduced in order to run the 2014 World Cup. A single ring of 69 skyboxes has been built between two regular tiers of seating. The ground’s delivery caused some concerns as the initial deadline of July 2013 was missed by over half a year. Even on opening day the arena was under 3% from finish. Projected budget of R$ 499 million was also missed significantly as the project topped at R$ 669.5 million.